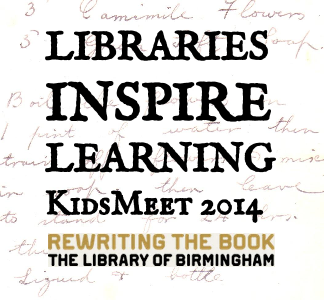 Once we arrived at the Library of Birmingham we made our way into the theatre, and watched some amazing presentations by Wheelers Lane primary School, TNT Ladywood and us (Paganel). When the morning presentations had came an end, we had a break and ate some biscuits. After the short break, Wheelers Lane doid some fabulous presentations about their favorite authors: Roald Dahl , Jacqueline Wilson and JK Rowling . The 9th floor was amazing - it was all about William Shakespeare. We saw some very old books (some didn’t even have covers on the front or back) they must have been very special, because they were all in glass containers. There was so much amazing artwork to discover, and many sculptures. There was many comfortable chairs and some very interesting maps. Sasha and I were helping Mr Philp tidy up the archive room, and me and Sasha offered to carry the boxes for him, while going down the travelators all the pencils came rolling out of the box ,so there was Mr Philp literally on his hand and knees picking them up in case the pencils got stuck in the travelators .